Marlow Moo has been stalking me for a long time now. His request? Teach him how to make butter chicken. So I finally caved in, and along came Marlow with his friends Connie of Mirabelle Macarons fame and Aditya Raghavan aka Big Addie to learn this Indian classic. This is a first time experience for me, as Marlow, Addie, Connie and I figured that we would live blog the recipe + pictures on Twitter and our blogs. Talk about racking up the pressure, eh? Luckily for me, I do have a loophole. As I tell all my students, Indian cooking is all about interpretation. Each household in India will have their own recipe for the classics, and everyone will (and should) believe that their recipe is the best. I guarantee that if you go to ten different households in India, you will get ten different versions of this dish. And every one of them will be delicious in their own way. Its what makes cooking so much fun, and gets your creative juices flowing. So, this experience is unique for me. I will be making butter chicken with my friends, and while I show them how to make this classic, they will be scaring the heebies out of me by posting real pictures along the way. 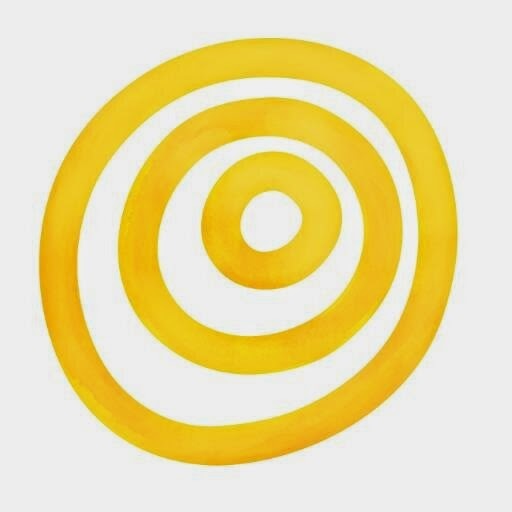 This post is linking all their posts, so check them out and tell us how you liked the experience. Follow @BigAddie, @MarlowMoo and @MirabelleMacs on Twitter as they tweet their way through the recipe. I would tweet too, except that I was busy making the damn chicken. Here is a link to Marlow Moo's excellent step by step live blogging, and pictures of this recipe. So now that I've disclaimed myself, we get back to butter chicken. To start off with, I know what a butter chicken should taste like. This is simply by eating it everywhere, from roadside dhabas and friends' houses to five star hotel restaurants and oh, in England too. I've been lucky enough to sample some amazing butter chicken, and my challenge today is to recreate one with at least an approximation of that luxurious, rich, creamy, mouthwatering aroma and taste. I am off to the Old Strathcona Farmer's Market, and I've bought some succulent organic chicken thighs from Sunworks Farm. We start off by making fresh homemade tandoori masala. We then make some garam masala from scratch. The chicken will be marinated the night before. We will then prep the ingredients for the makhani (butter) sauce. Then, grill the chicken in the oven (or perhaps the barbeque, if the snow stays away) The sauce will be made. Finally, we fold in the chicken into the sauce and simmer till its meltingly tender, and oh-so-delicious. Then garnish with more cream and butter and fresh coriander. We'll be serving it with some simple saffron rice and a cucumber raita. Plus, what do you know? We're also having mango frozen yoghurt with cardamom and rosewater + pistachios for dessert. No one's calling me a stingy hostess. Making this dish is actually not that complicated. With a little organisation, this is a simple recipe, that can be made relatively quickly, and with minimum fuss. The sauce is easy to put together, and the once the chicken is marinated, it gets grilled for that smoky tandoori flavour. You can cheat in many ways, if you care to. You could use tomato paste, instead of blanching and pureeing tomatoes, for example. You could easily use store bought tandoori masala and garam masala. The chicken can actually be marinated and then frozen, if you choose to make it in advance. So yes, its not a hugely difficult dish to make. I'll be posting pictures that my friends take, and will be making notes along the way. The idea is to cook, photograph, write out the recipe and post, all today. So. Lets make some butter chicken. PS - And what about my dear veggie husband and child? 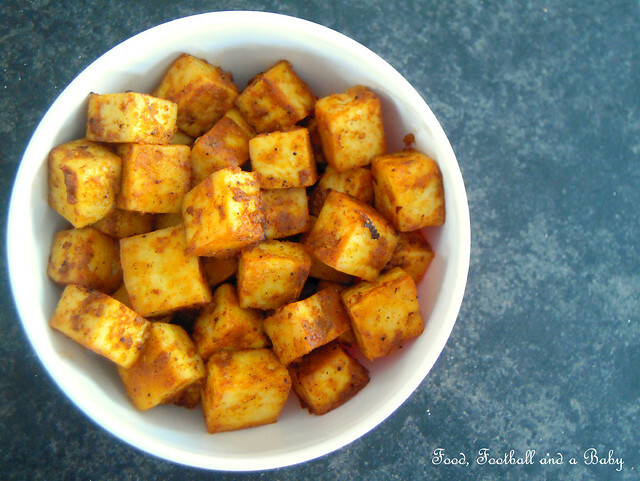 Fear not, the paneer has been marinated too. Whisk together the tandoori masala, yoghurt, ginger/ garlic, garam masala, paprika, oil, lemon juice and salt. Rub into the chicken pieces and marinate, at least 4 hours, ideally overnight. Heat a heavy, cast iron, oven safe pan, add a splash of oil, and brown the chicken pieces in batches. Transfer to an oven, and roast for about 15 - 20 minutes, turning once, until just cooked through. Take out of the oven, remove the chicken, and deglaze the pan with some hot stock, making it up to 1 cup. Keep aside. Heat the 2 tablespoons of butter and the oil. Add the finely diced onions to the pan, along with the whole spice garam masala. Fry on a medium heat for about 10 minutes, until the edges are beginning to go golden brown and the onion is very soft. Add the grated ginger and garlic to the onion/ spice mixture, and fry for an additional 30 seconds. Add the tandoori masala, garam masala, chilli powder, ground cinnamon and 1 tablespoon kasuri methi. Cook for a few seconds. Add the tomato puree to the onion mixture. Stir and fry together for about 15 minutes until the mixture comes together in a sticky mass. The oil will also start to separate at this point. Add the hot stock or deglazed pan juices from the chicken. Stir well. Add the chicken pieces to the sauce, and cook for 3 - 4 minutes, stirring to coat the pieces with the sauce. If the sauce is too thick, you can add about 1/2 cup of stock at a time to thin it. Slowly add the whipping cream to the sauce, stirring well as you go along. Add the remaining tablespoon of kasuri methi to the sauce. Add the cashew paste to the sauce, folding it in. Add the sugar, taste and adjust seasoning, if required. Simmer on a very low heat for about 5 - 10 minutes, until the sauce is very thick and creamy. Garnish with fresh coriander (cilantro) and a splash of cream. Serve with pulao or naan. To make tomato puree, blanch, peel and seed 4 - 5 large, fresh tomatoes. Blend until well pureed in a powerful blender. You can also use passata or Italian strained tomatoes instead of fresh tomato puree. To make cashew nut or almond paste, place a large handful of cashews or blanched, peeled almonds in a bowl. Add enough warm milk to cover the nuts and let them soak for an hour. Using a powerful blender, blend to a smooth, creamy paste, using a little more milk, if necessary. Skip, if you have a nut allergy. Are you using English cups or US cups? Thanks Elpiniki. It was pretty delicious. Anon, right now, US cup measures. But when I use a UK measure, I make sure I give the ml amounts as well, as in 1 cup = 250 ml. Is ginger paste the same as finely grated fresh ginger? Many thanks for your quick response. The reason that I asked is in the above printable recipe I can't see the metric equivalent after the cup measurements. As you know US cups are different measurements for different types of food whereas the Brits tend to use 8oz (237ml) for a cup of anything. This caused all sorts of cooking disasters when I first used an American cookbook not realising that the cup sizes were different! As it happens I have just bought some US cup measurers so I will try them out on this delicious looking dish. This sounds so delicious. I love Indian food but have actually never chosen to have butter chicken. This definitely makes me think I should try it. I confess to avoiding butter chicken as a result of a couple of terrible dishes in restaurants some years ago, but this is a completely different kettle of chicken. Looks wonderful. I've come to love sauces thickened with cashew nuts over the last year or so - this is definitely one to try. Applepie, yes its the same. When I make small quantities of food I just grate the ginger and garlic fresh. When making huge quantities, I whizz a lot of garlic and a lot of ginger through my blender, and store the resulting mixtures in my fridge. They'll keep for a few days. Anon, yes, I had a similar problem at first. But I've noticed that my Kitchenaid cup measures are 237 ml. And I bought these here in Canada. I never even realised that... but you can take it that normally when I say cups I mean US cups or 250ml = 1 cup. If I am precision baking I tend to use weight measures anways. Its a pitfall that, and I wish there was some way to make it clearer. Corina, thank you. Homemade always trumps bought anyway, and this dish freezes so well, you could defrost it in the same time you get a takeaway. This link shows the different cup measurements for different ingredients http://thebakingpan.com/baking-basics/measurements-conversions.html . You need to scroll down to the section "Weight Conversions for Common Baking Ingredients"
Classic Indian recipes are so delicious because of its rich and flavorful taste. Surely this dish is not an exception. The preparation is indeed very simple. This would be a great meal to serve for friends and family to enjoy. What I would give to have some of this right now!!! It looks fantastic. Yum! Thanks for taking part in this month's Sweet Heat Challenge! I have made butter chicken with my students at school and for the Nutritious Lunch on Friday - like this, completely from scratch. I had been told there was no such recipe in India, that it was purely a North American (British - yaddayadda) dish made with the Indian cuisine in mind and that there would never be butter like this in an Indian dish... so, very interesting. I am not sure I get how you did the live blog without Skype or something like that - but we will talk. I FELL ASLEEP tonight for three hours and it is too late to call!!!! I will call you tomorrow. SO SORRY. Congrats on the FBC mushroom win. That recipe looks and sound fantastic, too, Michelle! Very innovative. Catering, Indra, Lynds, thank you. We enjoyed this very much. Valerie, you might be mistaking butter chicken for chicken tikka masala. 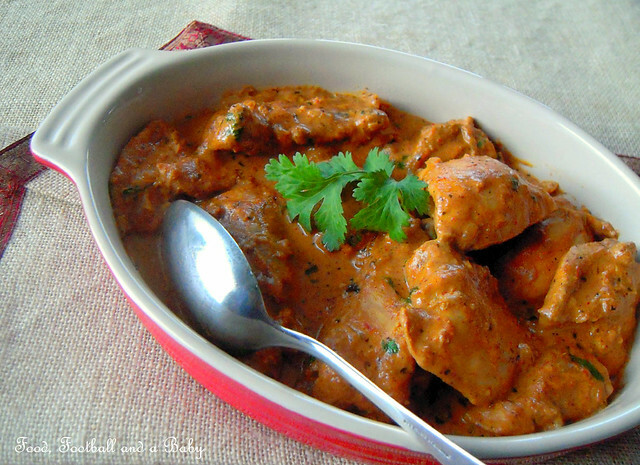 Tikka masala was a dish invented in the UK, when a customer asked for gravy with his (dry) chicken tikka. Butter chicken on the other hand was invented in India. It's sometimes referred to as Murgh Makhani (which translates as loosely as butter chicken) It is mainly a restaurant dish, though in recent times many home cooks have started attempting it as well. It doesn't necessarily need the butter, but I find that for the odd special ocasion its nice to go all out. I've made the dish with canola oil as well, and its pretty good. 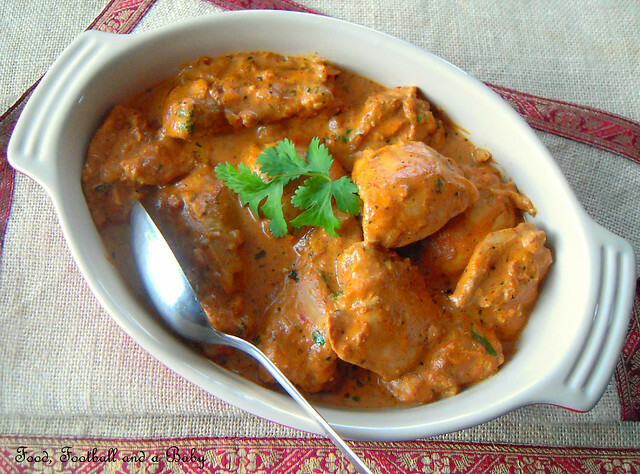 Thanks for giving Butter Chicken Recipe is a wonderful recipe. I found lot of Chicken recipes and good tasty and healthy also. Great recipe! Turned out exactly like in the pictures. One question, how to reduce the heat of the butter chicken? It seemed to turn out a little hot. Did I add too much ginger? I didn't added that much chilli powder. Yep, ginger can do it too. This shouldn't be a hot dish... so maybe season with a little more sugar? The red capped spice containers look awesome. And pretty too. Do you mind sharing where they are from? I made this a few days ago and it turned out wonderful. Thank you for the great recipe. Thanks for sharing. It's true, nothing seems more tasty and delicious than the dishes you grew up with. Nice post. 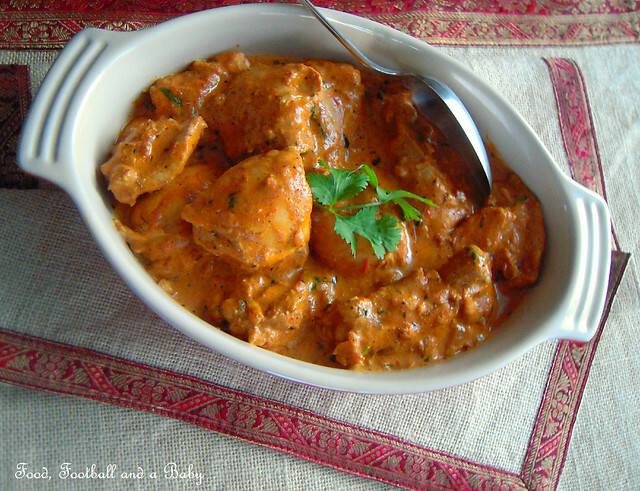 I just love butter chicken - it is my favourite Indian food recipe. Whenever I try an Indian restaurant this is the first dish to try really. I will try your recipe for sure. Ur a star Michelle! Keep 'em coming!! Indian restaurant menu and every part menu. Image of your recipe looks yummy and mouth watering. I found it simple and worth trying. I am surely gonna make it next time.Thanks for sharing. Love this recipe. Thanks for sharing this post. I love foods!!! The picture that you've uploaded really looks great and delicious. Hope I can taste all of it soon. I found your blog on Kitchn and the moment I read about your veggie husband and child, it sounded like my situation. I have been wanting to make butter chicken but hesitate because of them - but now there is the marinated paneer! Hi there, usually under the grill or at 400 F.
Wow this sound delicious. I am drooling over my keyboard. I have been making jour recipe several times but I cannot find kasuri methi and cassia bark in the stores I visit. Where do you get yours? ( I live in Edmonton, whyte ave area). Thanks ! Hello, you should be able to find cassia and kasuri methi (also known as dried fenugreek leaves) at Silk Road Spices (corner of 108 St and Whyte) For a cheaper source, pretty much all the Asian stores on 34 Ave and around 97 - 93 Street will carry them. Hope this helps. This looks fantastic Michelle! So rich and creamy, it will pair amazingly with some brown parboiled rice we want to cook. Yummy! Thanks for sharing the food recipe with us. I made this dish this past weekend and it was excellent! I may cut back on the cloves a little next time (as I'm not a big fan of them) - but will definitely make it again. Thank you for sharing!